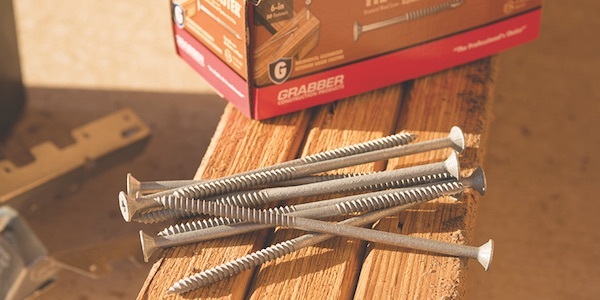 Grabber’s Tie-Master and Lag-Master are code-compliant structural framing fasteners designed to be used for nearly all wood-to-wood framing projects. Tie-Master and Lag Master are engineered as an all-purpose solution for deck ledgers, stair stringers, LVL beams, cabinet installations, roof trusses, girders, and more. Customers can choose the appropriate fastener length. Tie-Master and Lag-Master both feature a type-17 point which is designed to eliminate the need for pre-drilling. Both Tie-Master and Lag-Master meet ICC-ES 3531 requirements for strength, shear, and pull-out values. Tie-Master is recommended for joining wood to wood when a smooth finish is desired. When attaching structural plates, hinge plates, or when decorative metal pieces are used, Lag-Master is recommended.